The Twenty First Amendment to the United States Constitution was ratified on December 5, 1933. It reversed the Eighteenth Amendment and, once again, legalized the sale and distribution of alcohol. People all over the United States hoisted their favorite alcoholic beverage to celebrate the milestone. While the change in law allowed for the unfettered production and distribution of alcohol anywhere in the United States, beer enthusiasts in Miami were without a local brewer. They needed to wait for brewers from other parts of the country to ship beer into the local market. The owners of City Ice and Fuel Company took notice and capitalized on the opportunity. The City Ice and Fuel Company of Miami began to see a trend in ice consumption in the early 1930s. As home refrigerators began to replace ice boxes and impacted the sale of ice, the legalization of alcohol provided the company an opportunity to diversify its business. Soon after the ratification of the Twenty First Amendment, the ice company executives went to the nearest brick yard and bought enough material to build a brewery at 637 NW Thirteenth Street in Miami. The building was a stately two story brick building. Brick was the preferred building material for breweries because its insulation kept buildings cooler and it provided for a sturdier structure. The building was complete in June of 1934 in time for the hot summer months when beer was in high demand. The ice and fuel company executives were no strangers to the beer business. The company also owned a beer company in Granite, Illinois. It was in Granite that the trade name “Wagner” originated. The brewery in Miami was named the “Wagner Brewing Company”. Some of the first beers brewed in Miami were branded as ‘Wagner’, ‘The Pride of Florida’ and the ‘Daily Double’. At the time the company began brewing in 1934, the business was entirely owned by The City Ice and Fuel Company. The slogan for the brewery was “Perfect for Hot Miami”. Within a couple of years of opening for business, the Wagner Brewing Company purchased The Pilsener Brewing Company of Cleveland. They had also purchased a substantial interest in the American Brewing Company of New Orleans. By 1938, Miami beer drinkers were becoming very brand aware due to national advertising. The beers being made in Miami were thought of as lower quality than the beers being imported from St. Louis and other places in the north. There were campaigns that suggested local beer is no good because local water was not right for brewing beer. Wagner Brewing was losing market share and needed to do something to combat the perception that they were producing an inferior beer. They turned to the American Brewing Company to learn how to market their beer better. American Brewing had been in business since 1890 and was very successful in New Orleans. The beer that was their most successful brand was Regal Beer. The name “Regal” was said to have been derived by spelling “lager” backwards. Wagner Brewing decided to offer a new brew and operate under a new name. They changed the company name to American Brewing Company of Miami and began to brew Regal Beer. 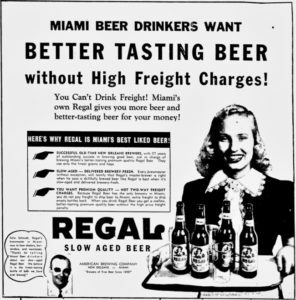 In 1939, Regal Beer and Ale were the only products produced in the Miami plant. New management made it a priority to combat the perception of Miami water being bad for brewing beer. The group tested water from Miami and other brewing centers from around the country. They concluded that Miami water was as good, and in some cases, better than water from other locations of famous breweries. The American Brewing Company began a new ad campaign that emphasized their findings. Given that there was added cost to import beer from other locations, one of the slogans was “you can’t drink freight”. It made it clear that the reason that Regal Beer was less expensive is that they didn’t have to add shipping costs to the price of their beer. During World War II, there was rationing of everything around the country. Given the limited availability of sugar and grain, as well as limitations in transportation, there was an impact on imported beer sales around the country. As a result, Regal Beer developed a loyal following during the 1940s. On February 6, 1958, American Brewing Company sold the Miami plant to Anheuser-Busch. The acquiring company was only interested in the production capacity of the plant and planned on discontinuing the brewing of Regal Beer. They had planned on using the entire capacity of the plant to produce Budweiser for distribution in the Miami area. However, the federal government objected. They felt that if the sale were to be confirmed, it would give Anheuser-Busch a monopoly on beer production and distribution. Anheuser-Busch lost an anti-trust suit and was unable to move forward with the purchase of American Brewing of Miami. Rather than shutting down the South Florida location, Anheuser-Busch chose to sell the plant. The National Brewing Company was the only bidder for the Miami brewery. Anheuser-Busch had no other choice but to accept National’s offer to buy the Miami plant. National immediately ran the brewery at capacity, producing not only Regal Beer, but also their own brands under various labels. One of their brands was Colt .45 malt liquor. The Miami plant was referred to as the Regal Brewery, even though it produced more than just Regal Beer. The brewery continued to operate until 1974, when National Brewing Company decided to shift the production of Regal and Colt .45 to their Baltimore plant. The closure of the Miami plant left 107 employees out of work. Miami’s Regal Brewing was producing 350,000 barrels of beer a year in its last several years in business. National Brewing’s Baltimore plant was newer and efficiently producing 2 million barrels per year. The decision to shut down the aging Miami plant was easy for the company. For those growing up in Miami in the 1960s and 70s, the lasting legacy of the Regal Brewing plant was the memory of the old “Regal” neon sign and the pungent odor emanating from its location on the southwest side of the 836 and I-95 interchange near downtown Miami. Miami News: “Miami’s Very Own, Ice Cold Lager Reeb”, Agnes Ash on June 20, 1964. Miami News: “Regal Brewery Closed in Miami”, Miami News on January 13, 1975. 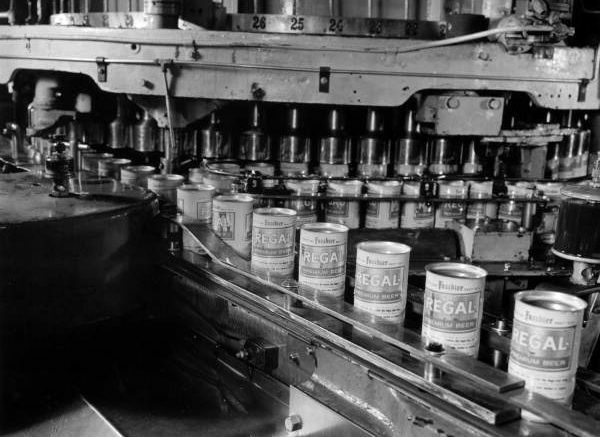 Cover: Regal Beer bottling at Miami plant in 1967. Courtesy of Florida Memory. 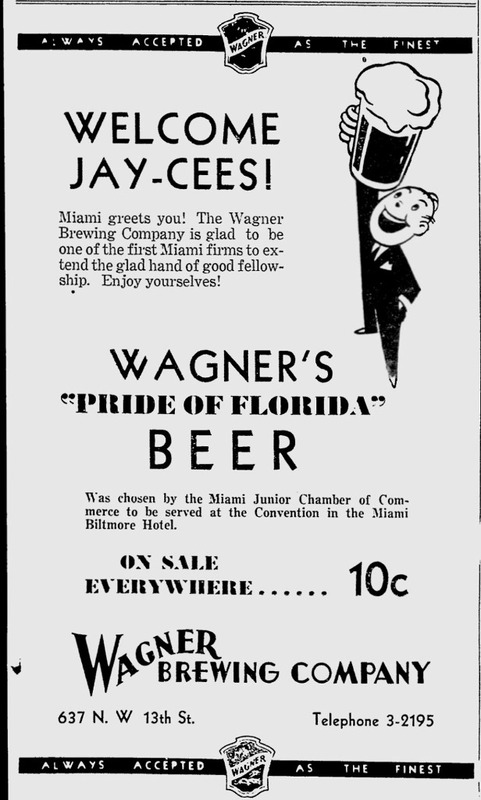 Figure 1: Wagner Brewing Ad in Miami News in 1934. Courtesy of Miami News. Figure 2: Regal Beer Ad in Miami News in 1947. Courtesy of Miami News. 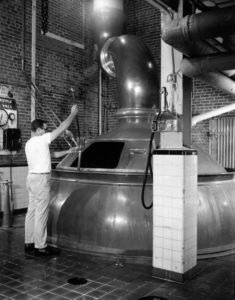 Figure 3: Regal Brewery vat in Miami plant in 1967. Courtesy of Florida Memory. Figure 4: Regal Brewery near downtown Miami in 1974. Courtesy of Miami News. 5 Comments on "Regal Beer of Miami"
Hi, I have a 78 record (early 1950’s) by an unknown artist singing two songs in a Country/Western Swing style on the CRL label – ‘Regal Boogie’ and ‘That Regal Feelin’ . Both songs are about the beer and were more than likely for promotion. Do you have any idea on date and who made the record ? I also remember a Fisher’s Beer about that time. I think 6-packs sold for .99 cents. Anheuser Busch (AB) did operate the Miami facility until approximately 1962 when it moved all of its Florida production to its new facility in Tampa. AB produced both Regal Beer and Regal Ale in Miami during this time. Examples of these cans products exist today. In addition, this may have been the only time that AB produced labels that it did not develop itself. Both Regal Ale and Beer continued to be produced by the National Brewing Co. under the “Regal Brewing” name. It was a sign than loomed over a tire company–SW Eighth Street–where one billboard higher than the other read, “The Wages of Sin is Death,” and (as I recall, below) “Drink Regal Beer.” Any others from that era recall the exact positioning?